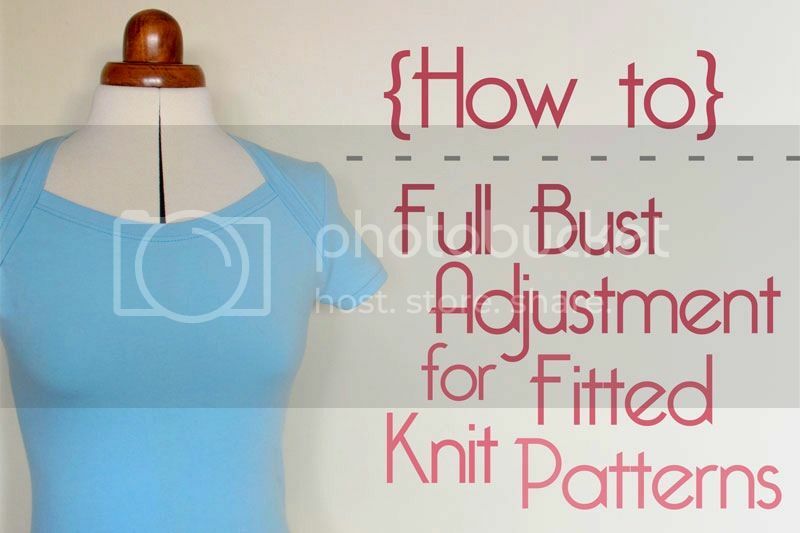 Okay guys, this post has turned into a pretty long and reasonably epic one and that's because there's not actually a lot of information out there on doing Full Bust Adjustments on fitted knit patterns. 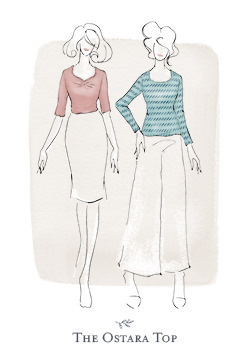 There are lots of tutorials for FBA's on wovens, but not knits - which I suppose comes down to the fact that knits are much more forgiving. 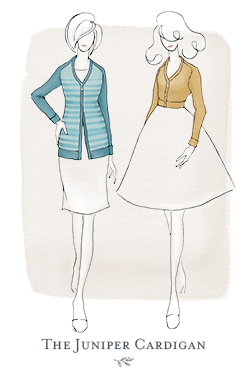 That being said, I completely understand that for some of you, an FBA may be needed, even on a stretchy knit like Bronte. 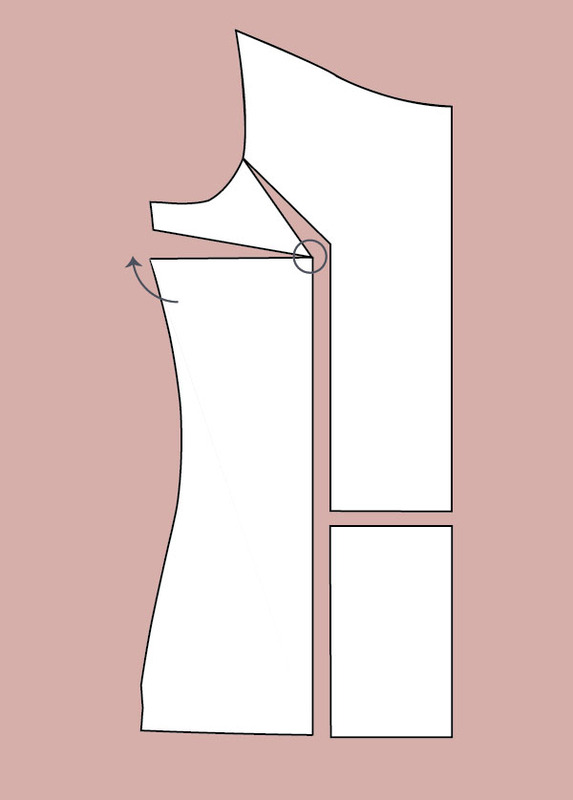 I would always do a muslin to check if you can get away without doing one first though, and one thing you may want to consider trying first is cheating the extra room you need in the front by grading up a size or two in the bust on the front pattern piece only, and then adding length at the 'Lengthen/shorten' line on both pattern pieces. The goal of an FBA is to add width and length to the front pattern piece to accommodate a bust that is larger than a B or C cup (most often a B cup in commercial patterns), without messing with the neckline. To do this, you generally slash and spread your pattern. (Note - you will end up creating a bust dart with a standard FBA, but don't worry, we'll talk about that in a moment). I'm not going to go into detail about how to do a standard FBA, mostly because there are so many great tutorials out there already (I love how clear this one is, but as I said, there are lots of great ones). What I would like to point out though is that when you take your high bust measurement and bust measurement to get how much you should be adding to your bust line, remember that you are dealing with a fitted knit pattern that is meant to have some negative ease (i.e it's deliberately smaller than your measurements and that's where the stretch comes in, to skim and hug your body). For this reason, I wouldn't add in the normal amount you would on a woven. Perhaps try adding half your normal amount to Bronte first, and then see if you need more. For example, if you have a 1 inch difference, try adding in 1/2 an inch first. One other thing you'll need to consider is where your apex actually sits on the pattern. Due to the fact that Bronte is a knit with negative ease, you can't necessarily hold the pattern up to you to find it (as you would on a woven). I honestly don't really have any scientific way of finding this either. All I can suggest is that you try on some other similar tops, locate your apex on them, and then transfer this to your Bronte pattern piece. 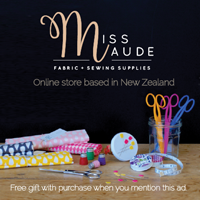 Alternatively, make up a muslin without the FBA and locate it once you've got it on, then do an FBA on the pattern piece. I can't think of an easier way, but if you have one, do let us know! 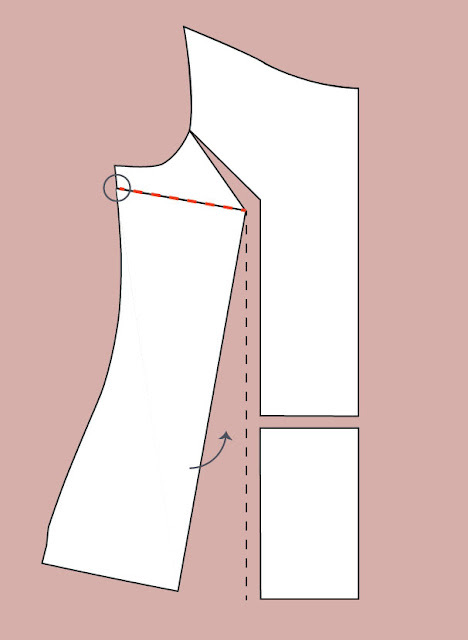 Now that you've done your standard FBA, you're going to be left with a side bust dart, and that's because you've added length to the side seam of the front and not to the back. 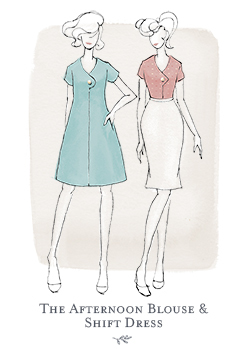 That dart takes care of the extra length you've added so that your front and back pattern pieces will match along the side seam. 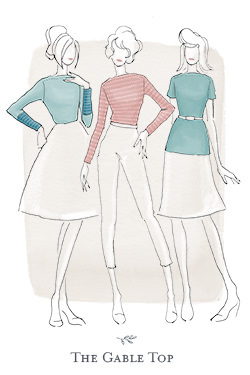 Do you see that pesky dart we created on the side seam underneath the arm pit? 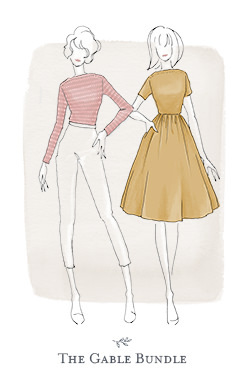 Bronte (and most knit t-shirts) are dart-less, so how do you deal with this extra side length in a knit t-shirt? Below are three options, but there are probably more, so do let us know if you have one. If you don't want to sew in a side seam dart, then you could think about rounding out the dart and then easing the excess into your side seam. I would approach this in much the same way I would when easing a sleeve cap into a set-in sleeve. 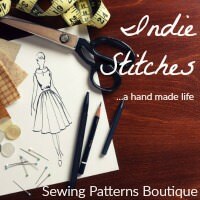 Put some basting stitches into the seam allowance, gather them lightly into a 'cup' and sew up the side seam. If you have a length-wise stretch in your fabric, you could also think about stretching your back piece down a little to help accommodate any excess side ease from the front. Be careful when doing this though as you don't want to stretch your fabric so much that you end up with wrinkles and ripples in the final garment. Does this picture look like half a Transformer to anyone else? 2. 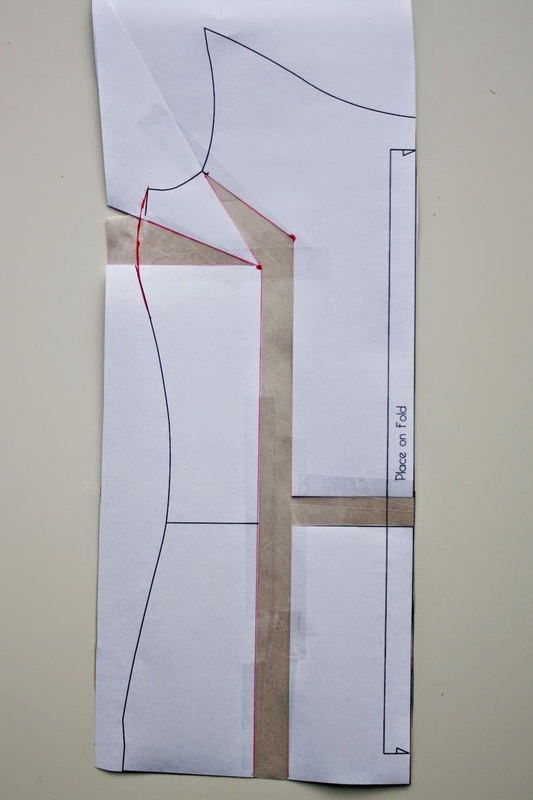 Transfer the straight line of your bottom left pattern piece (the red dashed line below) onto the paper below your pattern, you'll use this as a guide in the next few steps. 3. 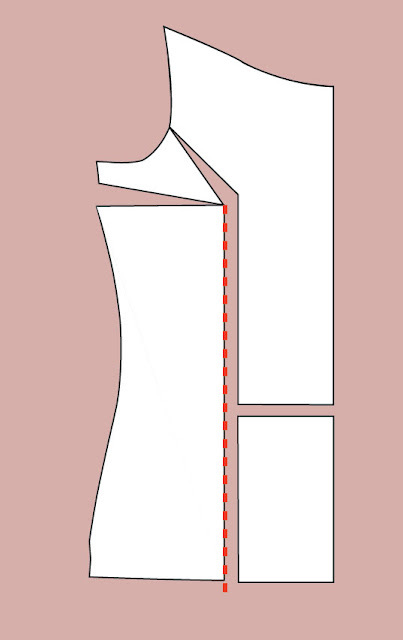 At the pivot point circled below, bring your bottom left bodice section back up and tape in place. Below is what that'll look like, with the grey dashed line indicating the line you drew in step 2. 4. 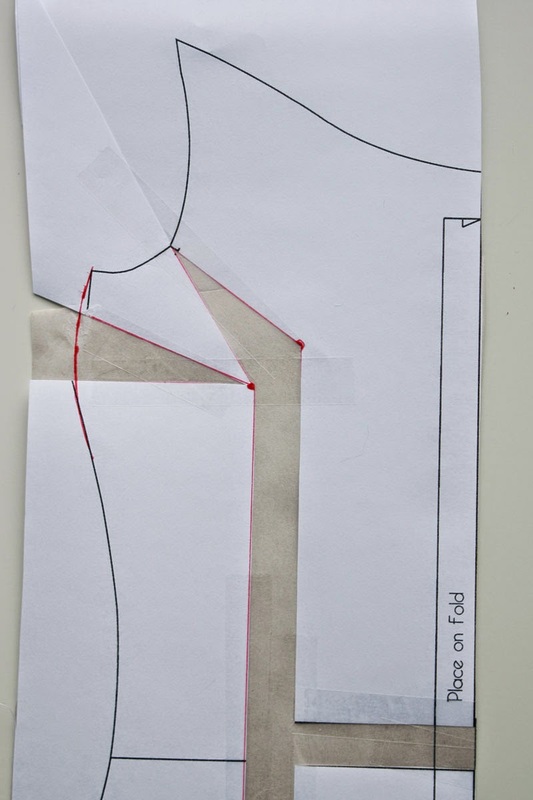 Cut back along that old 'dart' leg indicated by the red dashed line (yes, the one you just joined back up in step 3) BUT leave a pivot point at the side seam (indicated by the circle below). Using your pivot point, bring your bottom left section back up and align it with your original, dashed line. 5. 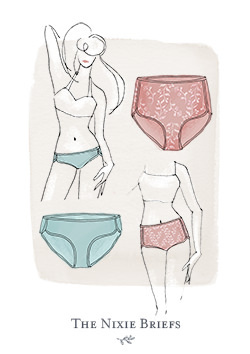 True up your bottom hem. And you're done!! 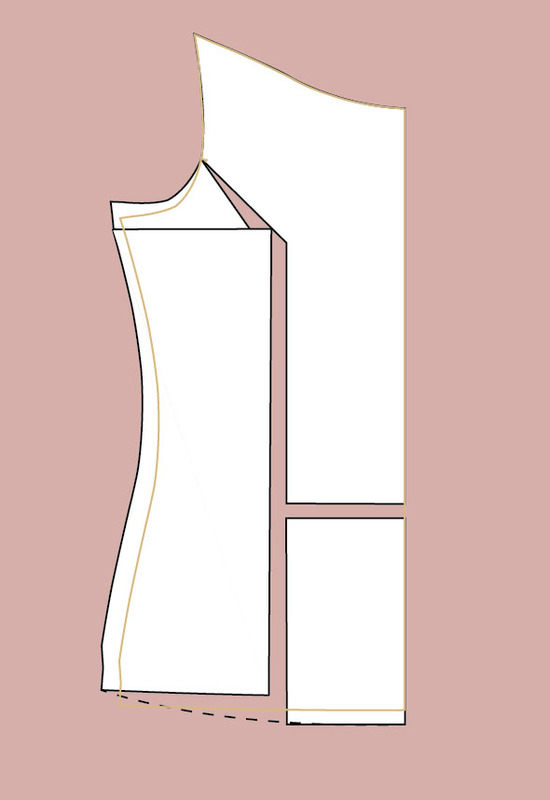 The honey coloured outline below is the original piece - you can see that you've kept the additional length and width that came from doing the FBA, but you've eliminated the dart at the same time. So that, Ladies, is how it's done. Let me know if you have any questions or have any success with this method! I'd love to hear about it. For some people, sewing the dart into the t-shirt might just be the best option, particularly if you have a large cup size. This might seem like a strange thing to have in a knit t-shirt, but it's only strange because it's uncommon, and uncommon doesn't mean it's a bad thing. It will mean you will have a beautifully fitting top, and if you have a busy print, you probably won't even notice that little dart line. 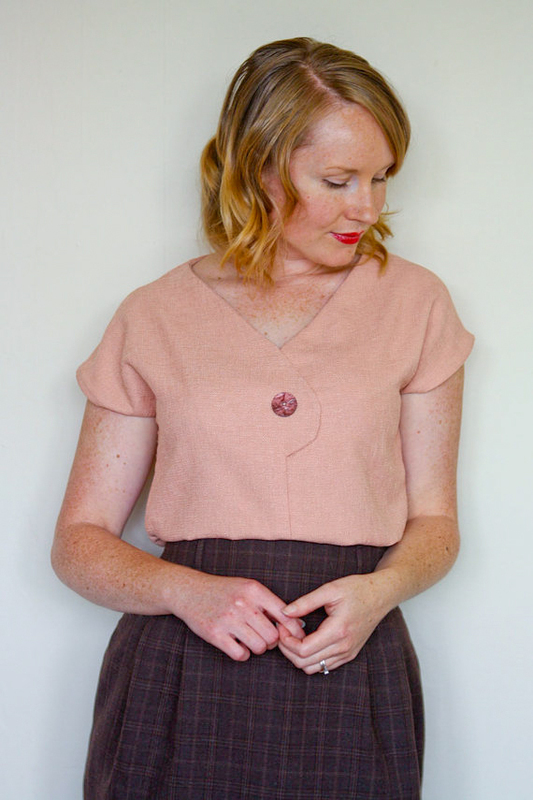 Two issues you may come across with sewing a dart in however are - if you have a lightweight knit, the dart may move around underneath, and with a heavier knit, you may see the outline from the right side. To combat both of these issues, you could cut the dart out close to the seam once it's been sewn in. 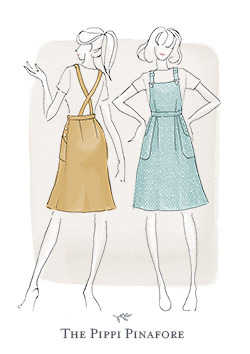 Do you have any tricks for doing an FBA with knits? 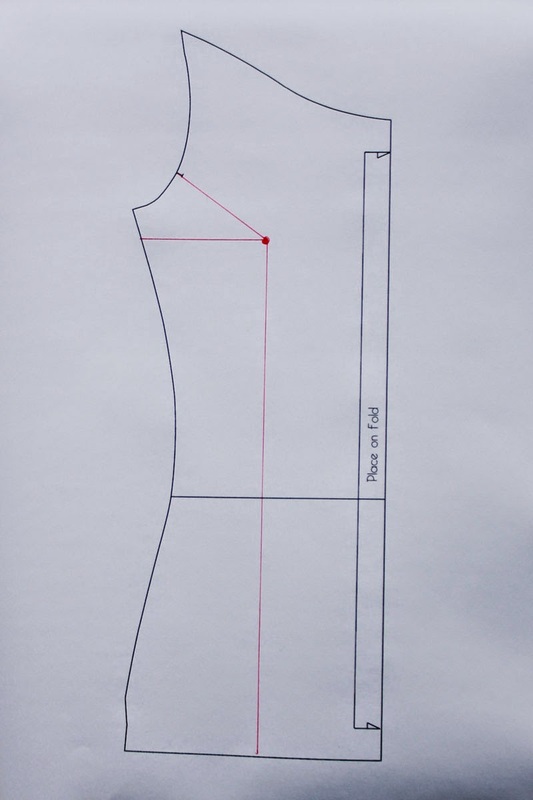 21 comments on "How To Do A Full Bust Adjustment (FBA) For Fitted Knit Patterns "
Oooh. I'm doing another project with knits right now and I'm coming to the conclusion that the grading to another size cheat isn't cutting it. I'm really excited to see this post. Because I really would love to try #2, the dart manipulation technique. This makes perfect sense. Gonna try it out! For manipulating the bust dart out just measure the length of the dart at the side and chop off corresponding length at the bottom. Hehe, oh, that makes it much faster huh? This is great! I just tried your method #2 on a basic tee pattern. First though, I traced off the original, so when it was all done, I could compare the two. 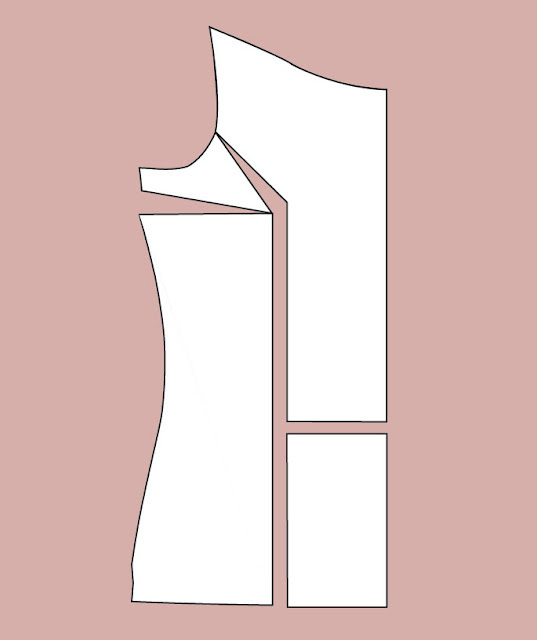 What I determined is that all of what was accomplished in the steps of slash/spread/rotate out dart, was the exact same thing as the following sequence: taking my original pattern piece cut out to my size, tracing onto a new clean paper the CF line, neckline, shoulder, and armhole. Next, I stuck a pin as a pivot point into where the armhole and side seams cross. Then, at the hemline I measured out from the side seam the same distance as I spread initially using your method (5/8" in my case) and swung the side seam out to meet this point. 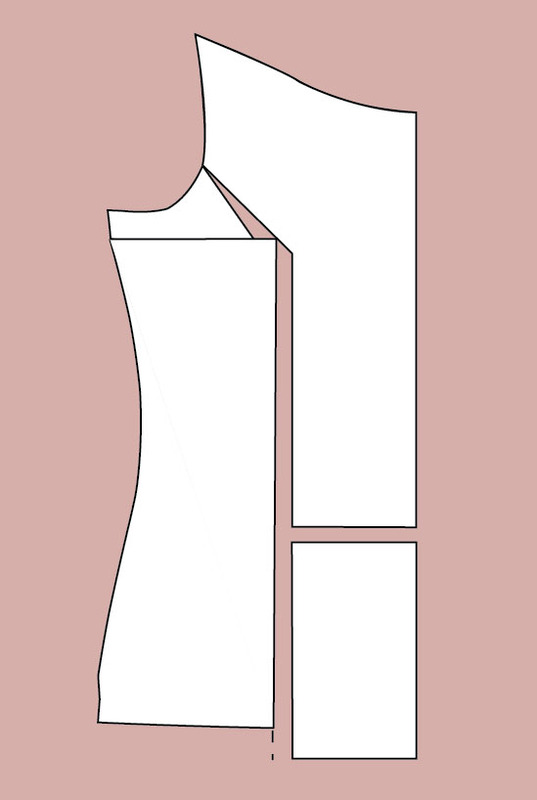 From that position, I traced side seam and hemline, extending the hemline the 5/8" to meet center front (my hemline already had a curve in it). Essentially, this would be the equivalent to pivoting a hip width adjustment. 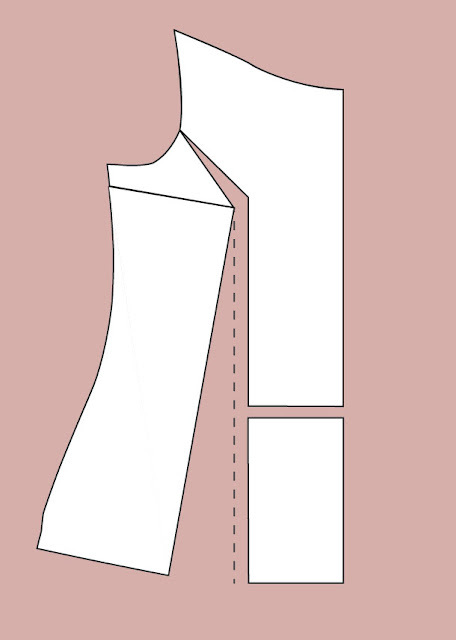 (Fitting Finnesse p49 jacket sideseam + tracing new hemline while in the swung out position, thus lowering the hemline at center front) I found this very interesting, and I don't know if it is an anomaly with my size/pattern/execution, or if the method you documented really could be done simpler. 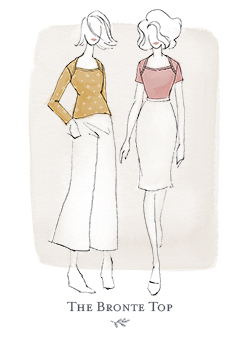 I have not actually sewn a shirt with the altered pattern and I'm new to FBAs, but comparing my altered piece with the original, it seems crazy that adding width at the hip and length at the front hem would be enough to accommodate the bust... but maybe? 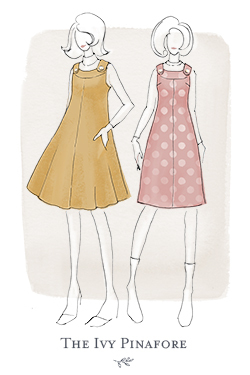 Have you compared your altered pattern piece to the original pattern piece and how does it differ? Mine was the same at the bust, but wider at the hips, and longer at center front. Still trying to wrap my brain around the different FBA methods and where they add room, but also wanting a T-shirt without a dart. It's all very confusing! I think I figured out the error that makes the bust width on the final piece the same size as the bust you started with. In your step 3, the point of the big red V should not be at the armscye, it needs to be at the same apex as the dart you're trying to close. In that case you would have rotated the dart to the vertical, which FFRP suggests not sewing on page 159, leaving a little more of a tent look... they have a nice little drawing illustrating that. In your steps above, that would be the equivalent of stopping at step 2 and filling that big empty V with new tissue. I still don't understand the rotating the dart completely out idea, but from what is shown on p159, the apex remains the same and doesn't change to the armscye. 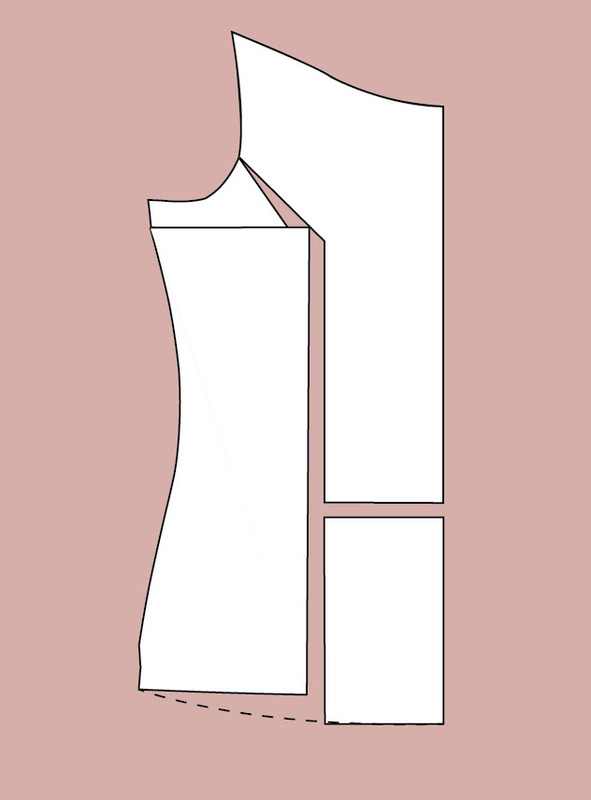 I'm not sure exactly how your pattern alteration is supposed to end up, but I don't think you meant to add width at the bust, only to remove it in a later step. This has helped me get a better understanding of FBAs and dart manipulation, so thanks for that! Another option I've used is to keep the dart, but sew it as gathers or a pleat (I prefer the inverted box pleat) at the side seam at bust level. It's much less noticeable than a sewn dart, it's easy, and I know from experience it works well for quite large FBAs. 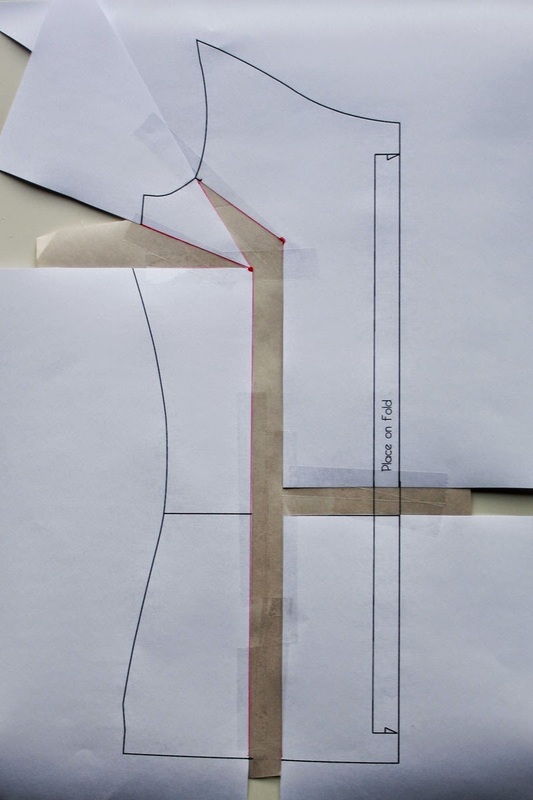 Do you also have to change the sleeve pattern with this method? I can't tell if the armscye changes from beginning to end here. Thanks! I've always wondered how to do this and I can't wait to try this! I did try your method and I'm very happy to say it worked perfectly! I so appreciate your brain for figuring this out, and your heart for sharing it. I'd thrown so many things away, because every other method I'd tried, added or distorted in other areas. The result from your method was beautiful. I SO appreciate your brain for figuring this out, and your heart for sharing it. After many futile attempts (plus a lot of wasted time and money) I stumbled on your page at around 2am the other night. I tried it, and it worked....beautifully. Every other method I'd tried added or distorted the shirt in other areas. Yours did exactly, and only what was needed. Thank you!!! This method widened the pattern at the hips and stomach but not at the bust. It also threw my side seams out of balance. Hi Justine, hmmm, which version did you try? 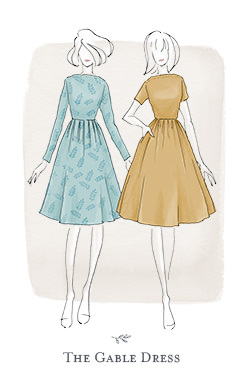 With the side seams, doing an fba will always throw them out which is why you need to either sew the dart in (which matches them up again) in number 3, gently ease the extra length in as highlighted in point 1 or true up the seams at the bottom in point 2. Point 2 has been edited, but I need to update the pictures. Hi Jen, I'm wondering if you can help me. I'm keen to make my second Bronte but first I need to work on the fit. After making my first Bronte I realized that I have broad shoulders, with the shoulder seam sitting about 2 cm higher on the shoulder than it should. 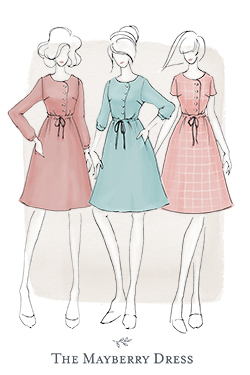 I've found some useful resources for wide shoulder adjustments, but due to the unique shape of the Bronte I can't quite translate these adjustments to the pattern. How would you suggest that I adjust the pattern for wide shoulders? Should I just trace around a bigger size? I should note that other than the shoulders the fit everywhere else is fine. You're a genius! This helps me so much -- thank you for the tutorial. 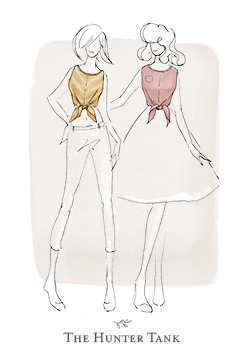 Introducing The Bronte Top! 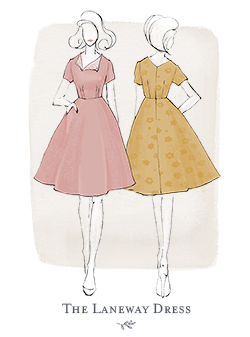 Pattern Number Two.